When it was created, R-value was really the only useful tool in evaluating the effectiveness of the available building insulations, among other materials. 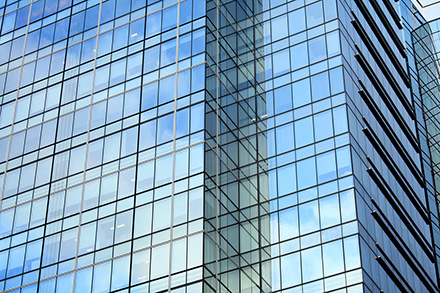 After the R-value rule was instituted, the energy efficiency of buildings improved, as well as the nation’s energy conservation effort and the marketplace and technology for insulations. Today, though, most of the insulation industry knows better, and R-values may well be dismissed as meaningless numbers on an insulation package that help to better organize warehouses. The R-value can be an extremely misleading value due to the laboratory guarded-hot plate apparatus test methods used in attaining these numbers. These procedures are conducted under ideal conditions, and the real-world performance has absolutely no bearing on such tests. As a result, the listed R-values can be higher than what actually occurs. These tests obviously favor fibrous insulations whose performance drastically drops with temperature fluctuations. The guarded hot-plate apparatus also does not take into account real-world conditions such as wind/wind-washing and moisture. If these conditions were taken into account, other insulation would far out perform fibrous products. These conditions will also effect fibrous insulation—because they are air-permeable—and will have far less of an effect on other types of insulation. 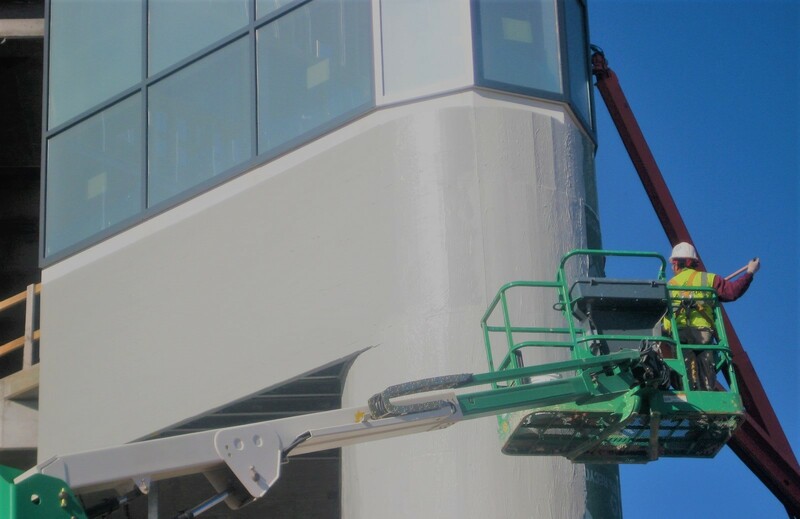 Wind-washing occurs as unconditioned air is allowed to move within air-permeable cavity insulations, such as fiberglass, cellulose, and board-stock insulations. Wind-washing, a form of forced convection, creates loss of thermal insulating properties because many insulation systems are not seamless and monolithic. The Cellulose Insulation Manufacturers Association (CIMA) has suggested research by Oak Ridge National Laboratory (ORNL) has shown a reduction of steady-state R-values caused by convective heat loss in low-density fiber insulation materials during cold periods, when the temperature difference (i.e. delta T) between the heated area of a building and its cold attic increases. CIMA states this phenomenon can reduce the steady-state R-value of affected products from 10 percent at a delta T of 10 to 12.8 C (50 to 55 F)—this is –8.3 to –3.8 C (17 to 25 F) in the attic of a space heated to 22.2 C (72 F) to as much as 40 per cent at a delta T of 32.2 C (90 F)— this is –27.7 C (–18 F) in the attic of a home heated to 22.2 C—that can occur during the most severe winter conditions in some portions of the United States. These R-values are not indicative of the material’s actual performance in a real-world installation, even with the best possible installation. 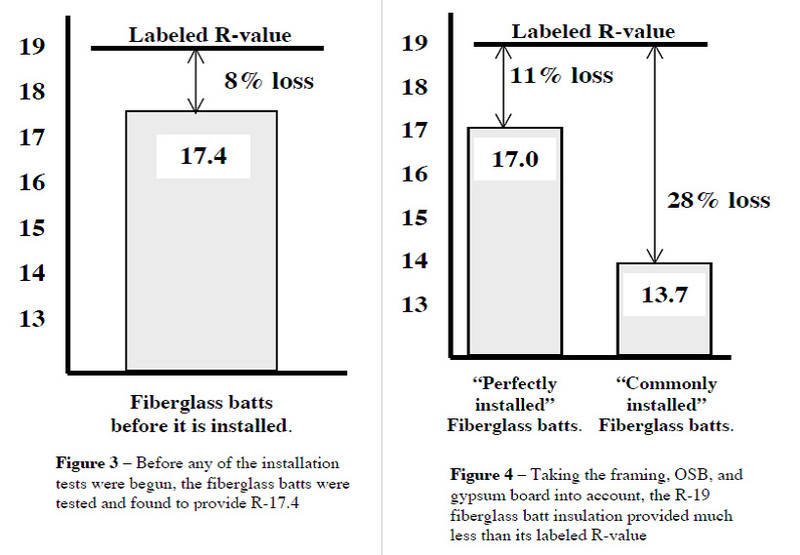 This study confirms a test conducted nearly 35 years ago by fiberglass manufacturers, and reveals the surprisingly large disparity between the labeled R-value and the installed performance of fiberglass batts.5 Zero-wind and zero-moisture are obviously not real-world conditions—buildings leak air and, often, water. Water vapor from the atmosphere, showers, cooking, and breathing constantly moves back and forth through the walls and ceilings. If an attic is not properly ventilated, the water vapor from inside a space can quickly condensate on the roof deck and drip into the insulation above the ceiling. Even small amounts of moisture will cause a dramatic drop in fiber insulation’s R-value—as much as 50 percent or more. So, why is the use of R-value perpetuated? Maybe it is because performance cannot be defined by any one number and multiple values are needed to describe its performance. However, the problems become clear when this philosophy is transferred to a real-world situation, such as buying a car. Suppose the salesperson tells you he has the perfect car, it being a ‘5.’ One would automatically wonder if it was a ‘5’ on a scale of one to 10, a 2005, a 5-speed, or a 5-liter. It is likely more information would be needed, such as many miles to the gallon or how many previous owners. The use of R-value alone is similarly limiting, yet there are building codes such as International Energy Conservation Code (IECC) and International Building Code (IBC) requiring these values. 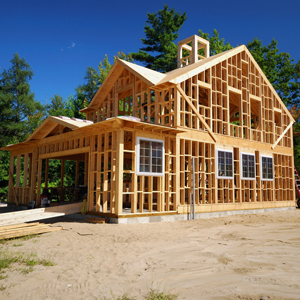 Passing building codes is like getting a ‘D–’ on a test, barely passing. In other words, it has become common for meeting building code requirements to be enough, when so much more can be improved far above the safety/efficiency requirements code inspections deem as sufficient. These codes were instituted mostly for safety, and certainly not for building efficiency performance. In a building, there can be areas, such as knee walls, or loose-fill insulation in attic ceilings, where fibrous insulation is being installed with no air barrier on one side (i.e. the attic side). Some of these codes are slowly changing, but this extremely common practice even further reduces the actual installed R-value from the package printed R-value. Fibrous insulations absolutely depend on an air barrier, on both sides, to try and attain the performance the packaging states. 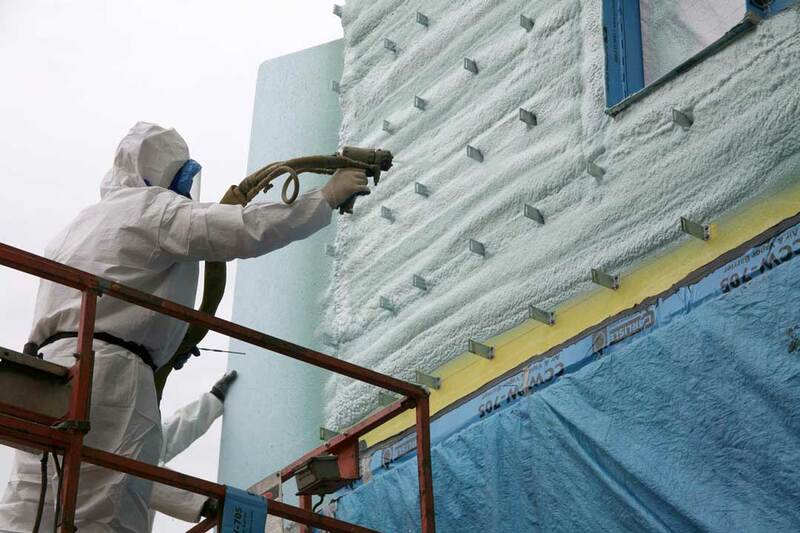 What further complicates this issue is other insulations such as sprayed polyurethane foam (SPF), with higher performance per R-value, are held to this value and compared on a level playing field with fibrous insulations. 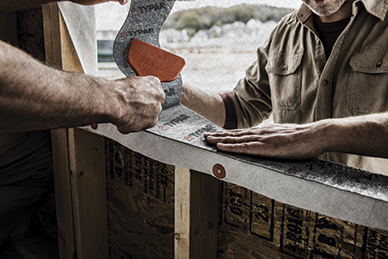 Consumers should consider many things when choosing an appropriate insulation, including but not limited to, building design, orientation, and vapor permeance, as well as R-value. However, if a closed-cell spray foam application was wanted in an attic, current code would require an approximate 152 mm (6 in.) R-38. This is a full one-third more material and labor that may unnecessarily prevent a great deal of specifiers to choose this product. 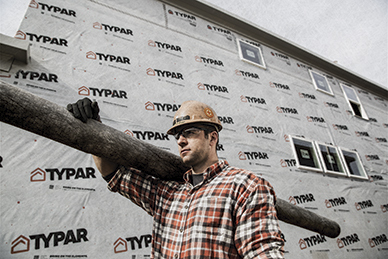 Put more simply, building codes in many instances are preventing the use of higher-performance insulation systems. Although the thermal performance of any insulation product in actual use is complex and includes many parameters, in this day and age the industry can do better than R-value alone. 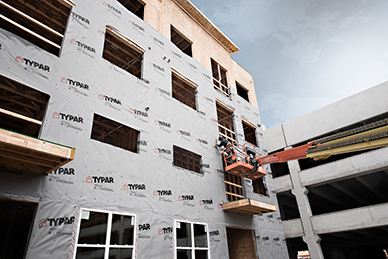 It is critical consumers, contractors, and specifiers have a useful, accurate tool for evaluating the true performance of numerous types of building insulations. There is some encouraging work being done by Buildingscience.com, with its Thermal Metric Project. The program’s goal is to develop a metric that can capture the in-service thermal performance of whole assemblies. More accurate measurements will allow truly high-performance assemblies to be identified and promoted. When the testing criteria for a material’s performance is flawed, antiquated, and not actually performance-based, it is time to come up with new testing criteria and a new value truly based on performance. 1 The opinions expressed in this article are based on the author’s experiences and do not necessarily reflect those of CSI or The Construction Specifier. 2 For more, visit www.ftc.gov/os/1999/08/rvaluefr.htm. 4 See J.E. Christian, J. Kosny, A.O. Desjarlasi, and P.W. Child’s “The Whole Wall Thermal Performance Calculator–On the Net,” which appeared in Thermal Performance of the Exterior Envelopes of Buildings VII (1998). 5 This information comes from R.M. Neisel’s “A Study of the Effects of Insulation Gaps on Building Heat Losses, Final Report,” a Johns-Manville Sales Corp., report released in 1979. 7 For more, visit www.sprayfoam.com/cnt/docs/16/Attictestingarticle1.pdf. 8 For more, visit www.buildingscience.com/documents/reports/rr-0901-thermal-metrics-high-performance-walls-limitations-r-value. Ken Wells has been part of the insulation industry for more than 17 years. In 2006, he started Elite Insulation & PolyPro LLC with his brother Chris, and father Bob; the company has been recognized with two National Industry Excellence Awards from the Spray Polyurethane Foam Alliance. Wells can be contacted at kwells@polyprollc.net.